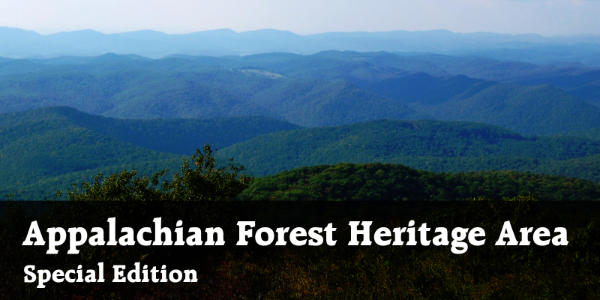 Are you interested in learning more about the Appalachian Forest Heritage Area and how you, your business, and your community can become involved? Attend our annual Spring Stakeholders Meet, Wednesday, April 30th through Thursday, May 1st, to find out how you can become a part of this regional asset. (Full schedule below.) Come for the entire two-day meet, or come when you can. Just don't miss the Stakeholders Meeting at 10:00 a.m. on Thursday! Call Phyllis (304) 642-7427 or Dawn (240) 321-1146 at any point if you have trouble finding the group. Your RSVP is requested to help with our planning. Please let us know which tours you plan to attend on Wednesday, and/or if you plan on attending the meeting on Thursday. Send your RSVP to info@appalachianforest.us or call 304-636-6182. Note the reservation cut-off date of April 18th for room block price at Wisp. 1:00 pm - Museum Tours: Meet in the parking lot of the Oakland B&O Museum (117 East Liberty Street). From there, tour the Garrett County Historical Museum, the Garrett County Museum of Transportation, and the Oakland B&O Museum. 2:15 pm - State Forest Tour: Caravan to the Kindness Demonstration Area, part of Garrett State Forest. 3:30 pm - Eco-Tourism Site Tour: Caravan to Blue Moon Rising, an Eco-Friendly vacation village (89 Blue Moon Rising Way, McHenry, MD). Dinner Recommendations: Cost on your own. Moonshadow Cafe (110 S Main St, Accident MD) or Mountain State Brewing Company (6690 Sang Run Road, McHenry, MD). More options available here. Lodging: Wisp Resort (296 Marsh Hill Rd, McHenry MD). A room block has been reserved at a rate of $74 + tax for a double room. Make your reservations by April 18th to receive this rate, and don't forget to mention "Appalachian Forest Heritage Area". Call 301-387-4000 to reserve now. 8:30 - 9:45 am - Networking Breakfast: Cost on your own. DC's Bar & Restaurant located at Wisp Resort (296 Marsh Hill Rd, McHenry MD). ***10:00 am - AFHA 2014 Stakeholder Meeting***: Learn about the Appalachian Forest Heritage Area and how you can become involved. Hear from AFHA AmeriCorps members working on improvement projects throughout the region. Meet the AFHA Board of Directors and staff. 12:00 pm - Sandwich Lunch: Provided at meeting site. 1:00 pm - Welcome to Western Maryland: What's going on in Garrett and Allegany Counties? 2:00 pm - Heritage Areas Panel Discussion: What are heritage areas and how can they benefit your community? Panel will consist of Dawn Hein (Mountain Maryland Gateway to the West Heritage Area), Deidra Ritchie (Canal Place Heritage Area), Phyllis Baxter (Appalachian Forest Heritage Area), and Jeremy Morris (Wheeling National Heritage Area). 3:00 pm - AFHA Board Meeting: To follow after meeting adjournment. Friday, April 25th, 5:00 - 8:00 p.m.
C-HOPE is proud to announce that the Darden Mill, located on the corner of Railroad Avenue and First Street in Elkins, will be opening its doors to the public. Celebrations kick off with a Grand Opening of the building on Friday, April 25th, from 5pm to 8pm. Restoration, preservation, and renovation work at the Darden Mill has occurred over several years, with funding from a USDA Rural Development grant, and with some labor provided by the AFHA AmeriCorps hands-on team members. Today the building stands as a tribute to Elkins' industrial past, but also as a new and hopeful enterprise in downtown Elkins. The Grand Opening will feature a new exhibit by the West Virginia Railroad Museum titled "Innovation & Impact: Railroads in the Mountain State." The building is also already home to the AFHA exhibit, "Discovering the Appalachian Forest," which is still on display. The Grand Opening will feature a ribbon cutting ceremony through the Elkins Chamber of Commerce, as well as appetizers, and live music performed by Gerry Milnes. We hope to see you there!